Large, wet snowflakes are sticking to the windows of RevZilla headquarters. On a day like today, the slate-gray sky makes it easier to think about hitting the slopes than the starter button of a motorcycle. All in all, we don’t have too much to complain about weather-wise this year. Winter has been relatively mild and last week Punxsutawney Phil cast no shadow. What better way to usher in that lovable rodent's prediction of an early spring than hanging out with like-minded folks and cool motorcycles? Here is a list of some of the moto-related events happening around the United States this spring that are worth shoveling your driveway for. 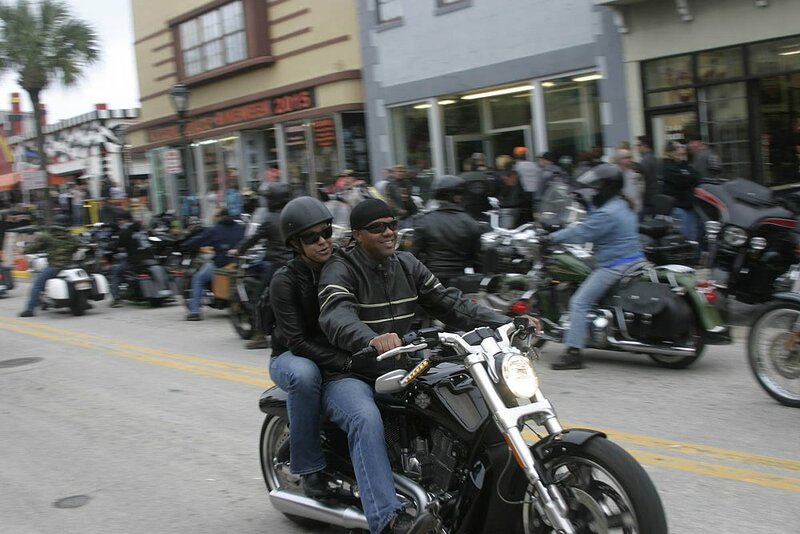 This year marks the seventh annual event hosted by Thor Drake, the wild, passionate genius behind See See Motorcycles. The One Show is a combination custom bike show, minibike race, beer-drinking contest, and rock 'n’ roll show rolled into one. If you are looking for the perfect date night for you and your sweetie pie this Valentine’s Day weekend, and find yourself on Portland’s east side, the One Show is a guaranteed aphrodisiac. Mama Tried was born and bred for all of you Midwesterners who are tired of the West Coasters hogging all of the good times. Each day of this jam-packed weekend offers different forms of moto-entertainment. The starting gun fires on Friday night with indoor flat track racing starting at 6:30 p.m. followed by a rager kicking off at 9 p.m. at The Harley Davidson Museum. The show itself will feature custom bikes on Saturday and things wrap up on Sunday with a four-hour ice racing session. For those of you who don’t hang up your keys over a little snow, this event is for you. This highly curated event takes on a different theme every year. The featured class for 2016’s Sixth Annual show will be “Motocross, Trials, and Enduros,” along with a few additional surprises. There will be a “Kickstart” party on Friday night, which includes private access to all of the bikes on display as well as your admission to Saturday’s main event. Located between Philadelphia and New York City, it gives all of you East Coasters a reason to don your cold-weather gear, kick over those bikes, and head out for a ride. 2016 marks the 75th Anniversary of Daytona Bike week. What started as a sandy race in 1937 has grown into one of the premier motorcycle events in the country. From the bar hopper crowd to the Superbike enthusiast, there is literally something for everyone. unless you like girls in bikinis and guys in sleeveless shirts. I’m kidding, you’ll see way too much of that. In last year's Daytona 200 race Eric Wood crashed in the middle of the race, picked his bike up, and still finished 12th. Much like Bruce Springsteen blew the doors off with his third studio release, “Born to Run,” the third annual Handbuilt Show is shaping up to be bigger and better than ever. This show is the brainchild of the boys over at Revival Cycles, who decided to invite all of their friends over to party with them during MotoGP weekend down in Austin. The biggest difference between you throwing a party for your friends and Revival doing it is that their friends consist of some of the biggest names in motorcycling today. If you’re looking for something to do during race weekend, add this to your list. OK, this is not a motorcycle event. But like Lemmy discussed in his article about dreaming of joining the cast of Top Gear, most folks who love motorcycles as much as our readers do can probably appreciate great machinery, regardless of the number of wheels. If you are stuck in Los Angeles and can’t make it to Austin to party with Valentino for MotoGP, you can still run around town with Magnus Walker. Loosely translated, “luftgekühlt” means “air-cooled” and Luftgekühlt III is the third annual celebration of Zuffenhausen’s finest export: Porsches. More specifically, it’s a nod of the cap to pre-1998 Porches of the air-cooled variety. This is arguably one of the most prestigious motorcycle events in the country. For 2016, the featured theme will be pre- and post-war sport and racing machines. It costs $75 to get in, lasts for five hours, and smells of rich mahogany. If you get a chance to attend, you will be among a genuinely authentic group of passionate motorcyclists. If you get a chance to ride there, plan to attend the Quail Ride, which in years past has meant a victory lap at Laguna Seca. Perhaps you've hit a few of these in years past, maybe you're planning on attending one or two this year, or there might be a few you feel should be included on this list. Let us know. As for me, my top priority is to convince Lemmy to head out to Milwaukee with me so we can try our hand at ice racing. I figure it shouldn’t be that hard, as long as I promise him plenty of beer, and of course, a stop at the mothership.